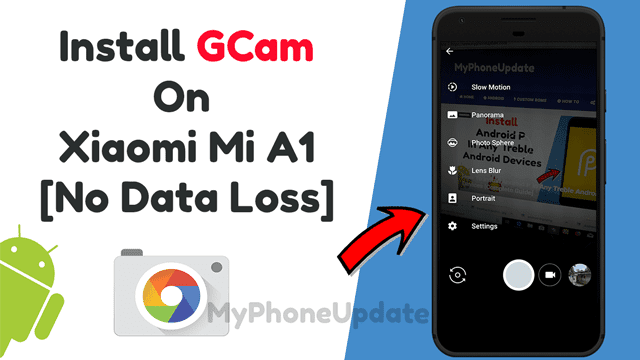 Do you want to Install GCam On Xiaomi Mi A1 After July Updates [Without Losing Data] Now you can Install GCam Camera On Mi A1 Without Losing Data. We are here with the Guide To Install GCam On Mi A1 [No Data Loss]. Using this guide you will be able to Install Google Camera On Mi A1 Without Root and also without unlocking the bootloader and also without any data loss. As you might be knowing that a few months back we can easily Install Google Camera on Mi A1 using the GCam tool but after the may security patch update either you Lock or Unlock the Bootloader of your device your data is wiping out. so, in this article, I will guide you how you can install GCam without any data loss. and also your phone bootloader will be locked. And if you follow these steps and Install GCam then you will not face any problems in OTA Updates. You will be able to properly install OTA Updates. So, let’s go straight into the steps. Follow these steps carefully, as mentioned in the steps just follow it please don’t miss any of these steps. Disable all your Security Pin/ Pattern or Fingerprint Locks for some time. After completing the whole process you can add your security Pattern/Pin & Fingerprint Unlocks. Note: You Must Setup ADB and Fastboot Drivers on your pc otherwise your device will not be recognized. Step 6: Now go to GCam Platform Tools >> Now Press & Hold Shift Key and in GCam Platform Tools Window, Right Click and Select “Open PowerShell Window Here”. After that, you will see the “PowerShell Window”. (do not hit enter now). Come to your phone and “Press and Hold Volume Down Key” and then Hit Enter. Step 9: After running this command your device will boot into TWRP Recovery. After your device boots into TWRP Recovery >> On Your Device “Tap On Keep Read Only” >> Now keep your phone aside. And carefully paste it on command window, Hit Enter. Step 10: Now Next We Have To Enable EIS On Mi A1. So, Just Follow The Steps Shown Below. After that again your phone will boot into FastBoot Mode. Now we have to lock the bootloader for that follow the following steps. This is to be done so that our phone warranty does not get void. We can easily claim warranty after locking the bootloader. Step 2: After typing this command Press and Hold Volume Down Key” Then Hit Enter. If you see that App is not working well then you can “Force Close” the App and it will work fine. You have Successfully Installed GCam On Xiaomi Mi A1 Without Any Losing Data. So this the full guide on How To Install GCam On Xiaomi Mi A1 After July Updates [Without Losing Data]. If you have any question related this method or if you are facing any problem in Installing Android P In Any Treble Android Devices, then make sure to comment down below. We would love to hear from you. I have rooted a1 with july update. What steps do I need to skip? In that case you have to first unroot your phone and then you have to do the above steps. If you still have any issue contact me on facebook i will help you out.